Sometimes I need to be reminded that the greatest wisdom comes from experience. There is just no way to replace the knowledge that comes from years of touching a plant, wrestling with it, sitting down to lunch with it. Even after years of such experience, one little twist will reveal whole new avenues of knowledge. I've been harvesting cattail pollen for a long time now, but I learned quite a bit about cattail pollen over the last week. 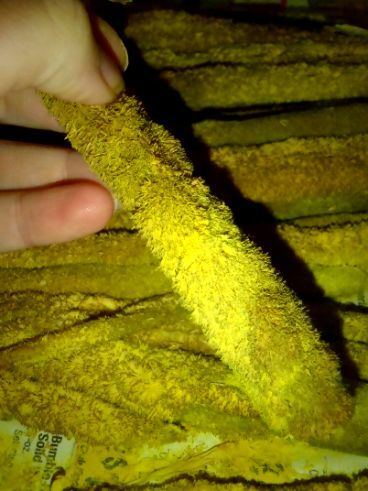 When I first started harvesting cattail pollen, I'd use the traditional method. I'd squish out onto the edges of ponds, and repeatedly bend the heads of cattails into a container and shake them to accumulate the yellow powder. For me, this method was frustrating. It meant spending hours of sweaty labor while standing in mucky water and high temperatures. And even so, I'd come away with astonishingly small amounts of my prize. 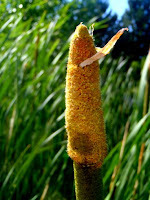 Eventually, I discovered that I could have a much more relaxed experience, and collect more cattail pollen by snipping the male portions of the cattails into a bag and taking them home. Once at home, I could sit on my back steps, and leisurely slap the cattails against the inside of a bowl to collect the cattail pollen. This year, the drought has meant that there are fewer cattails flowering, and those that are aren't as heavy with pollen as usual. It has forced me to refine my method of collection in an effort to make the most of the few pollen-loaded cattails I was able to find. Much to my surprise, I've been able to vastly increase the amount of pollen that I'm able to collect. 1. In their early stages, cattails have a bottom female portion, and an upper male portion. Both are green, but hold the characteristic sausage shape of mature cattails. Out in the field, I looked for male portions of flowers that were visibly yellow with pollen. I snipped off as many of those top portions as I could reach from five different locations, perhaps 60 in all. That isn't a great quantity of flowers, especially considering how small they all seemed to be this year. 2. Back at home, I spread all of those cattails onto a single layer on a piece of newspaper and let them sit for a few hours. It is important make sure the cattails start to dry out. If they are stacked up and stay damp, they won't yield as much pollen, and they rot much more quickly. 3. Three times a day, I worked my way through the stack of cattails, picking up each one and banging it on the inside of a half-gallon mason jar. In the past, I've only done this one time. But I was surprised to discover that the cattails continued to puff out yellow, over and over again. It took four days for all of the cattails to finally be spent. 4. 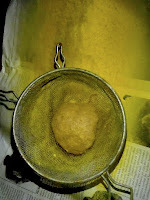 On a daily basis, use a sieve to separate the pollen from the fluff and bugs. There is more non-pollen material in there than it would appear to the naked eye. You will be left with a ball of fluff in your sieve. 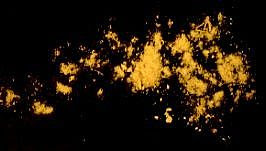 Spread the pollen thinly on a piece of newspaper or a sheet pan, and place it in a cool, dry, non-drafty place for a few days so that it thoroughly dries. It is important to do this once a day because the moisture in the cattail pollen can cause it to rot very quickly. Trust me, I speak from experience. Nothing will break your heart quite like spending days collecting small amount of yellow powder, only to discover that it has gone slimy and started to smell of gym socks. 5. 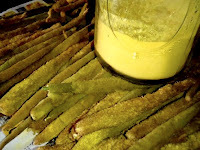 The sifted, dried cattail pollen keeps fairly well in the refrigerator, and even better in the freezer. My favorite way to eat it is in cattail pollen pancakes. You can find a recipe for those, and a few other recipe ideas if you click through to this older post. 6. One last tip - wear yellow! I'm sharing these tips with Real Food Wednesday. Whoa, this is way different from how I learned. But it makes sense. It is pretty nice to be able to sit at home and shake the cattails at your leisure. I'm just surprised by how much more pollen I'm able to collect. I feel a little slow because I thought cattails were always brown. Must be good stuff if you go to all of that trouble to collect it. Sounds more labor intensive than saffron. To be honest, the cattail flowers aren't really terribly visible until they turn brown. You have to be looking for them to see them. And I suspect you are right about cattail pollen vs. saffron. Do you collect enough to use all year? Unfortunately, no. I've got enough this year for three batches of cattail pollen pancakes. One batch to be shared with my best foraging buddy, and another batch to be eaten as an appetizer for a party with my girlfriends. Third batch, however, is up for grabs. Do you know what carnations taste like? Sort of floral, but green? Cross that with very mild corn, and you've got cattail pollen. Ha, refrig it overnight. Good idea. I guess I'm still not used to it being over 90 degrees inside, which tends to speed decay! I'm dying to taste this. I'm playing the hunger games for you! That just may be the most awesomely strange comment I've ever gotten here. Bookmarking this for next year. Wish it weren't too late for me now. Awesome info, B! Thanks for this. Banging the cattails against a glass for hours was unappealing to me due to this pollen allergy of mine... the new method sounds more reasonable. Looking forward to tasting some!